Me: I cannot wait for Fall! Mom: Well that’s because you haven’t seen it in a while. Mom: At home- You haven’t been here in the Fall since you begun college four years ago. You’re right mom. Now my anticipation for fall has just been magnified by twenty. Fall at home: There is this one main two-way, but really should be one-way, street that is always leaf-strewn with the crunchy kind of leaves that make the perfect noise under your fearless and guilt-ridden foot. Halloween over here takes you back to the medieval Halloween era, even though since I turned fourteen, my house door has been locked shut and the lights have been dimmed and blinds closed to deter kids from coming to our house. It helps that our doorbell no longer works and where there was once a button, only a hole exists. There is no alcoholic flamboyancy as there is on campus, and there is no vulgar costumes on people of age to whom trick-or-treating no longer applies. Diwali in late October/November is welcomed by gusty winds that almost sacredly fails to exterminate the wax-lit diyas, earthen lamps, and other candles lit by myself on the house’s stoop, covered in an embroidered dupatta, shawl, under the gaze of my parents, on our way to Gurudwara, temple. However, even if this were not the case and I had experienced fall at home all along, I know myself and I would never have been satisfied in the moment. At that moment I was in a vehicle with black leather seats that were absorbing the June sun’s rays. This attribute of never being satisfied has dwindled considerably though, and nowadays, really only rings true in the context of seasons. Many of us have these seasonal associations. In March, we cannot wait for summer to arrive so that we can shed the coat that is necessary since it is 40 degrees Fahrenheit, but in shielding our torso from the chills, the collar only succeeds in baking our necks, targeted as they were by the sun. In the summer, we cannot wait for the hustle and bustle of the backpack-conceived-hunch-back children amongst the working adults (pronounced “Ahh-dults”, with an emphasis on the first syllable), clogging up the morning and mid-afternoon/ early evening traffic. In the summer, we cannot wait for the NYC winter holiday tourists who cause throughout-the-day traffic delays: Traffic on the road and on YouTube since their nonsensical stopping on the otherwise seemingly, from a bird eye’s view, mobile sidewalks, causes the locals to record and upload these tourists’ shenanigans as payback for making the lives of locals’ more difficult. I know it is technically not summer yet, but for the academic crowd, ironically, (since we thrive on being technically correct -always), we refer to the time between the end of one academic school year and the beginning of the next one in a single clear and concise term that gets the point across: “Summer”. I have taken advantage of the mango season and had many a long walk to take advantage of the weather. I know it’s not my birthday yet, but getting older at a faster pace, (in my head at least since time cannot truly go “faster” and/or “slower”), is no longer welcoming. My parents are not planting the basil leaves this year and since I always, without fail, binge on the resulting pesto pasta from said basil leaves, no basil and therefore no pesto pasta, is not a bad thing. My metabolism isn’t getting any faster. Summer, it’s been great so far but I think it’s time for me to set up camp in the library again. Fast forward or rewind to you, me, sitting at a desk with work in front of us and it is week one of the not technically referred to Fall season - the season of the academic year’s return. We know we’re not pregnant, unless we are, and we know we’re not so ego-centric as to not give a care that we are contradicting ourselves purposefully when we change our mind about wanting Fall the day after it arrived, unless of course we are ego-centric and illogical creeps. The hoodlums middle school and high school students in NYC didn’t even finish their school years yet. Do you feel like you want Fall to come now too? The summer really only just begun. Summer loving is still there but the summer whining in anticipation for Fall is inevitable. 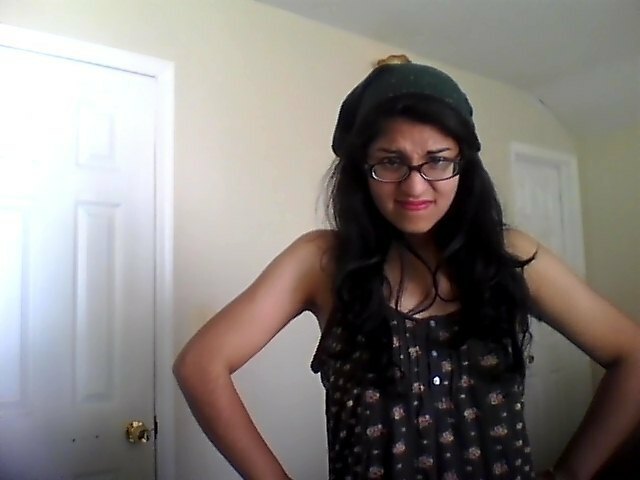 Who knows, if I whine about wanting Fall enough I may just walk out with this ensemble: Winter hat and spaghetti strap tank.